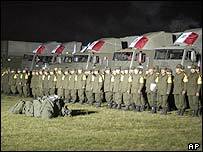 Mexican troops have crossed into the US to help distribute aid to the victims of Hurricane Katrina. The troops travelled in a 45-vehicle convoy, carrying water treatment plants and mobile kitchens capable of feeding 7,000 people a day. Mexican engineers, doctors and nurses were among the military deployment heading towards San Antonio, Texas. Within two years the two countries were embroiled in the US-Mexican war, which saw Mexico lose significant chunks of territory. As the hurricane relief effort continues to build up, another 12-vehicle Mexican convoy is scheduled to enter the US later this week. 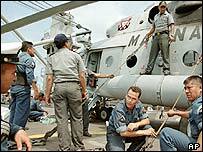 Mexico has also dispatched a navy ship with emergency rescue equipment towards the Mississippi coast. US troops and Texas officials will accompany the Mexican convoy to provide security. The Mexican deployment went ahead despite a warning from US Secretary of State Condoleezza Rice that Mexican officials should not attempt to visit the flooded city of New Orleans. Ms Rice told Luis Ernesto Derbez, Mexico's minister for foreign relations, that the US was unable to offer the kind of security arrangements it usually offered visiting officials, a spokesman for Mexico's President Vicente Fox said. Thousands of US troops, state police and national guardsmen are on the streets of New Orleans, where looters and armed gangs have roamed free since floodwaters submerged most of the city. Mexico is among scores of countries to have offered cash donations or practical assistance to the US. Ms Rice has said no offer that will ease victims' suffering will be refused.